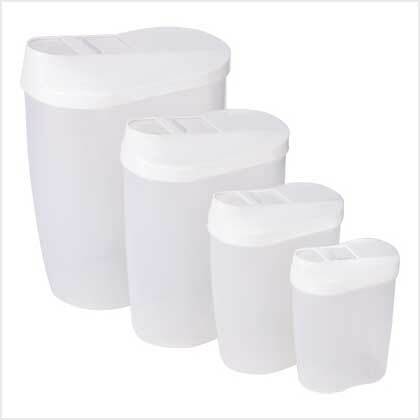 Buy this set of bulk food storage containers! The Plastic 8-Piece Nesting Storage Containers Set is a good choice for storing staples, cereals, spaghetti, rice, and other recipe ingredients in your cupboard, pantry, or on the counter top. Easy to use, this multiple sized set offers flip-top spout covers for pouring the food stuffs stored inside. Durable plastic Resists absorbing flavors. Containers can nest To save space when not in use. Covered pouring spout in each lid Makes it easy to transfer food from contaner to bowl or pots and pans. Sliding openings in lids Ensure that containers stay air tight and food stays fresh longer.